Four Sisters of Bon Secours served as honorary coaches and ball carriers for the women’s basketball game at Furman University in Greenville, South Carolina this past Saturday. Streamed live on ESPN3, the event marked Furman’s annual “Play4Kay” fundraiser in support of the Kay Yow Cancer Fund for breast cancer awareness and research. The fund was founded in 2007 in honor of the former NC State University head women’s basketball coach. Cancer survivors and those fighting the disease were admitted free. For each ticket sold, $3 was donated to the Kay Yow Fund, and the first 300 fans admitted to the game received a free pink T-shirt sponsored by Bon Secours St. Francis Health System. Pictured from left – Srs. 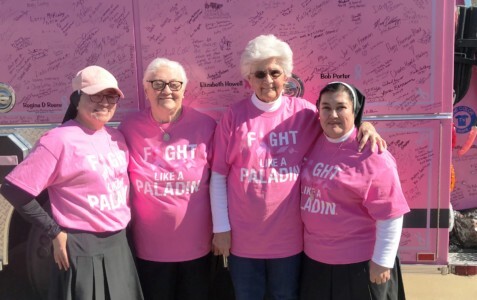 Gabriela Ruiz, Kathleen Moroney, Dorothy Brogan and Rosa Sanchez pictured with the Berea Fire Department pink fire truck outside Timmons Arena prior to the game.